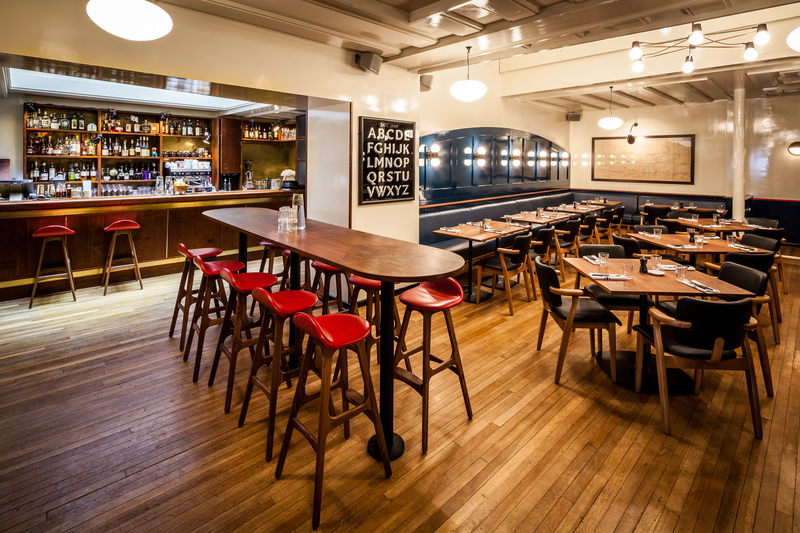 Umami | Boy Mestizo: Hoy, London! Want to know what sort of texts I like to get? This one came from my brother. 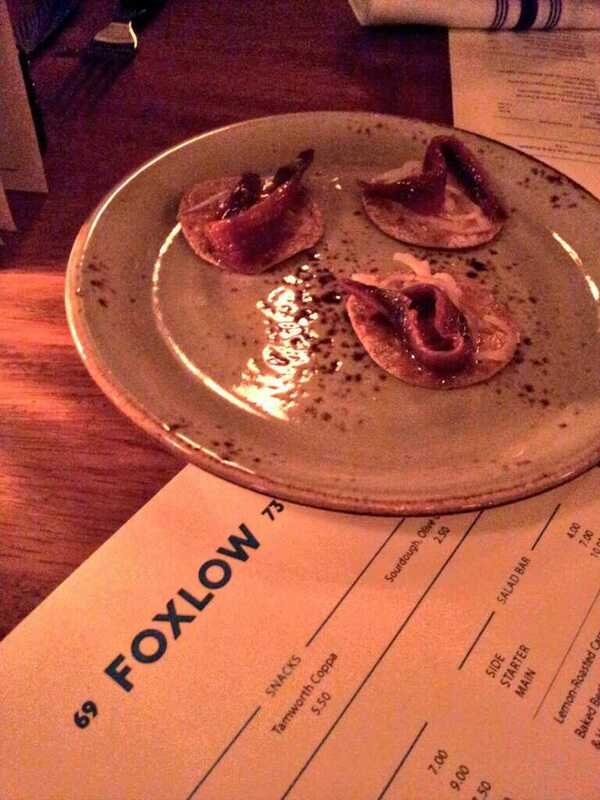 As the booking also came during Foxlow’s soft opening, it also included a complimentary drink. I therefore do not hesitate to say: I love you man, you mah BRO (more specifically, my ADOBRO – cheeky plug for our Filipino supper club right there!!). Billed as the more casual sister restaurant to Hawksmoor, that esteemed temple of steaks, Foxlow’s offering of charcoal-grilled and slow-cooked meats automatically appeals to the carnivore inside of us all – hence all the excitement that I’ve seen bandied around online. However, judging from the menu we were presented with that night, I would say that Foxlow is more an ode to all things umami – there are various ingredients in use there, like beef dripping, anchovies, meat stock, Gubbeen cheese, capers, kimchi and others, that suggest that those guys just want to make sure you get your savoury fix, whether it come in meat, vegetable or fish form. And let me tell you – we chowed down and got our savouriness on. Guided by our helpful and chatty waitress, who tried to ensure that our order included all of the big-hitters from the menu (e.g. “I would say the monkfish is pretty nice and a must, but since you’re after meat, I wouldn’t bother”), we managed to get ourselves a good spread. First to come along were the anchovy and goat’s butter crisps. This consisted of a very thin crisp wafer flavoured with goat’s butter, topped with freshly chopped shallots and a piece of anchovy. Our waitress stressed the quality of the anchovy, with the chefs aspiring to provide a healthy balance of salt and fresh fish flavours; once you pop one of these into your mouth, you can see what she means. 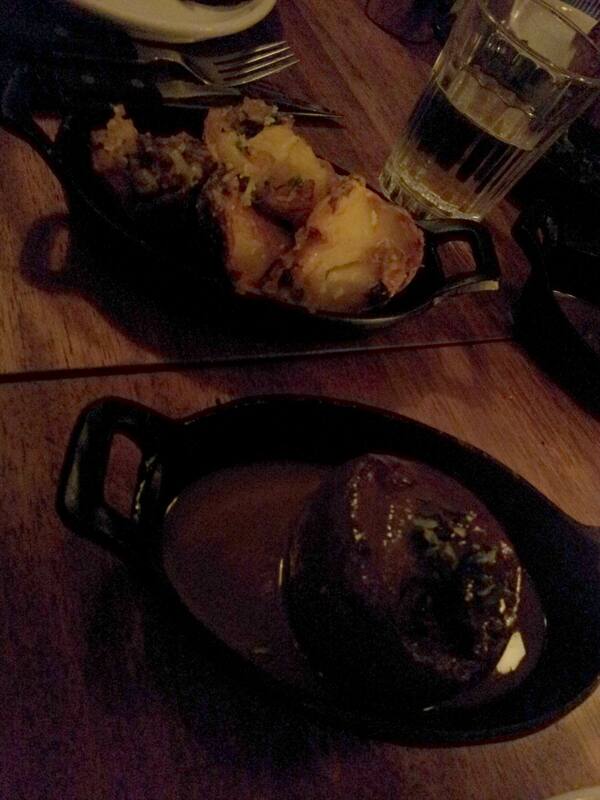 It was packed so full of flavour and savouriness, you were left craving for more, in spite of how rich they were. Brixham crab with devilled mayonnaise. Get some crabs! Then came our starters, which we dished out amongst the four of us: Crispy Five Pepper squid, Brixham crab with devilled mayonnaise, Baby back Iberico ribs and Smokehouse rillettes. 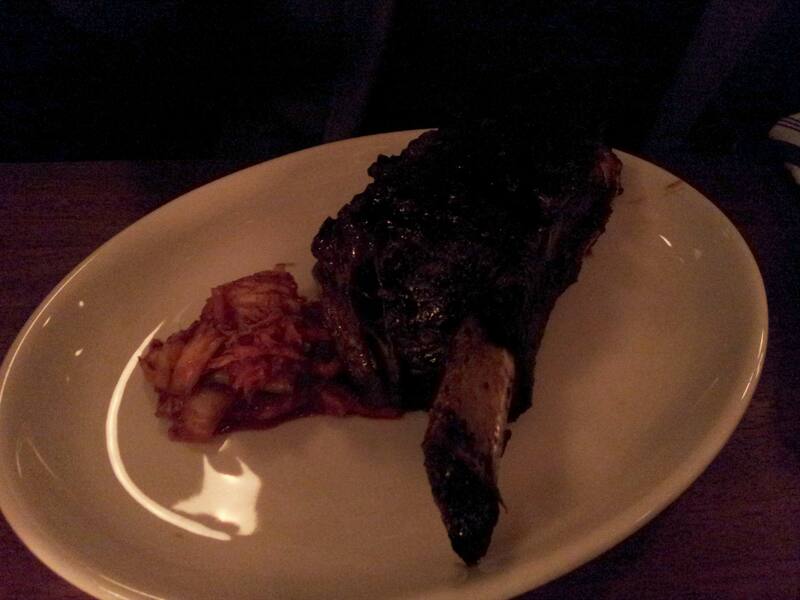 The squid had a hint of smokiness to it, but otherwise I felt them to be rather unremarkable. Good – not greasy, not salty, suitably tasty – but unremarkable. 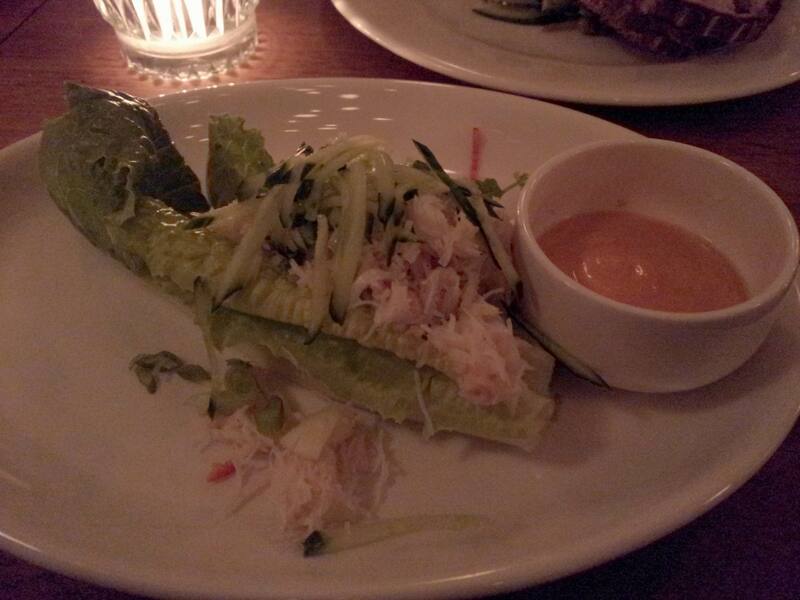 As for the Brixham crab, it was served shredded on green leaves, which I felt made it a bit more difficult to appreciate it fully. Still, it was refreshing and beautifully flavoured, with the devilled mayonnaise adding interesting but not overpowering bite. 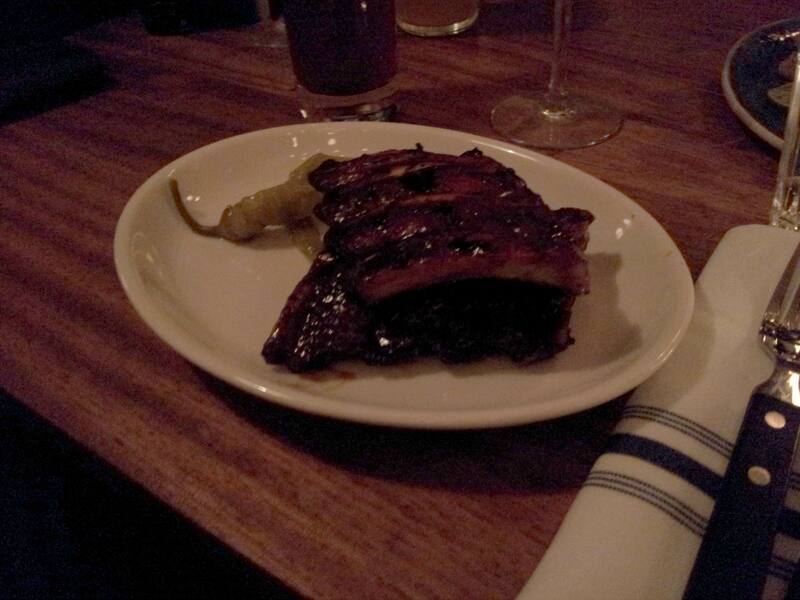 The ribs, as expected, were very tender and full of barbecue flavour. The smokehouse rillettes, on the other hand, were not as smoky as suggested by the name, but were brilliant in texture and taste. The winning starter, I felt. So far, so good. By this point, we’d finished our complimentary drinks (my Tom Ford – a twist on the Tom Collins with gin, Benedictine, lemon and soda – was well-received for its light and herbal touch) and I made a move for the wine, selecting a very smooth and medium-bodied rioja crianza from the decently-sized wine list. I’d originally earmarked the Ten-hour beef shortrib with kimchi for myself, but seeing as two of the group were also going to order it, I made the adventurous choice and went with the charcoal-grilled Iberico pork ‘pluma’. As our waitress explained, pluma is a type of cut from the loin, and given where it comes from in the pig and the quality of the meat itself, it can be served medium. And oh man was it tasty. It was tender, had a brilliant charcoaled crust to it and just packed an absolute savoury punch, almost akin to a well-flavoured steak. I have never had a cut of pork loin that tasted like this, and the next time I find myself in Foxlow I will definitely order it again. The other dishes, in comparison, fell by the wayside. It feels bad to denigrate the other meats on offer, but this is more a tribute to the surprising delights of the Iberico pork pluma than a comment on any form of substandard quality on the parts of the other dishes. The beef was amazingly tender and was also beautifully-flavoured, but after the pluma it tasted rather pedestrian – it was like “Yeah, I’ve had shortrib before, so what?” The Eight-hour bacon rib with maple chilli also suffered a similar fate: again, slow-cooking it for that long produced meat that you could cut like you had a hot knife going through butter, and the flavours of maple and chilli produced something rather special – but hey, bacon rib tastes of bacon and we all know what that is like, right? Before I do any more disservice to the other mains, let’s talk about the sides that we shared. The Beef-dripping potatoes with Gubbeen and capers provided us with very crispy and more-ish potatoes that were a very good accompaniment to our meals; the Broccoli with chilli and anchovy were crisp very well-appreciated, although the chilli was almost undistinguishable beneath the savouriness of the anchovy; the Sausage-stuffed onion was a slightly-caramelised onion in a thick and tasty gravy filled with substantial and nicely seasoned sausage meat – a good combination, but as a side dish it seemed rather overbearing, with the sausage meat competing too much against the main courses. So, you’d think that by now we’d be done, right? Think again. Dessert was dangled in front of us, and we just had to take a bite. 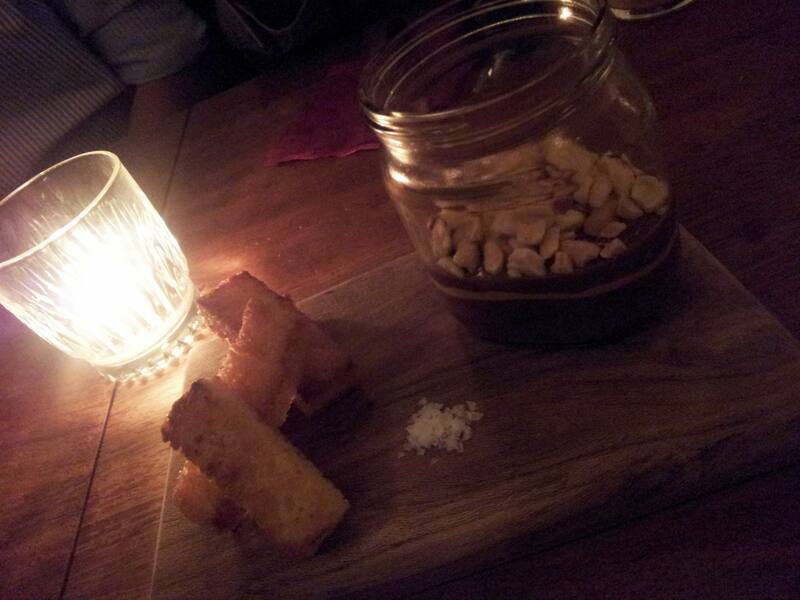 My Peanutella & Sweet Toast was a crushing blow to any semblance of healthiness I retained: here we had a Nutella jar filled with layers of, er, Nutella, caramel, peanut butter and peanuts, served with lightly-fried sweetened toast batons and – in case you thought Foxlow forgot the savouriness – a sprinkling of sea salt. It was perhaps a bit overwhelming, but in some instances that’s okay. Such as when you are chowing down with your bros, homes. And thus our meal was complete. It provided enough sustenance to last us for a leisurely walk down to St Paul’s, across the Millennium Bridge and all the way to London Bridge (one of us is still new to London *cough* tourist *cough*) – and you know what? I’d happily walk that distance again just for a bit more of that Iberico pork pluma. Mmmmmm. VERDICT – A good place. The dishes we chose were all good and decent, but there were certain highlights that really wowed, like the Iberico pork pluma – and unfortunately that did rather unceremoniously shove the other meats into the shade. But we can overlook that, for Foxlow was a very friendly and cheery place for us, and that’s already a very big plus for the place. 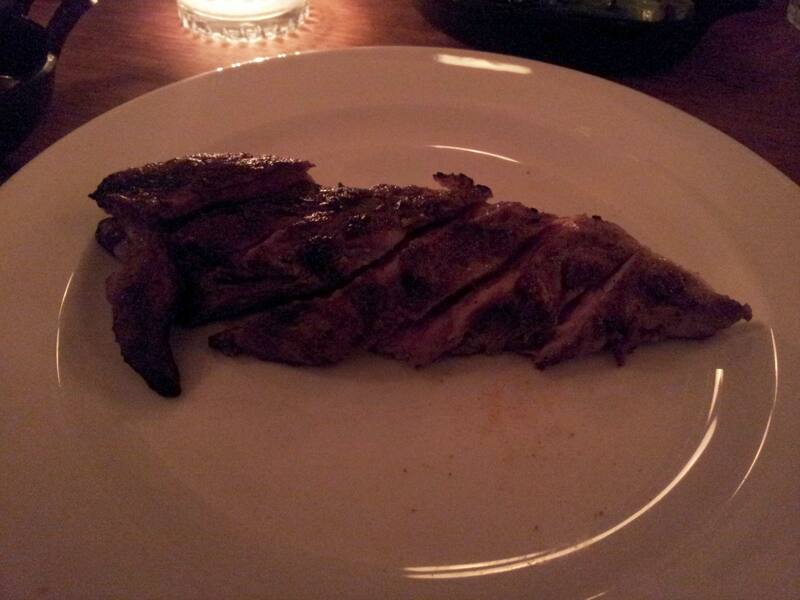 Oh, and did I say that I liked the Iberico pork pluma?